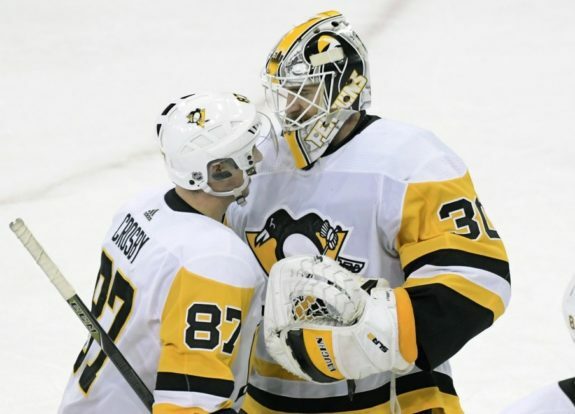 NEW YORK — Matt Murray stopped 28 shots to keep up his strong play since returning from an injury, and the Pittsburgh Penguins beat the New York Rangers 7-2 Wednesday night for their season-high seventh straight win. Sidney Crosby, Evgeni Malkin, Jake Guentzel, Kris Letang and Dominik Simon each had a goal and an assist. Zach Aston-Reese and Tanner Pearson also scored to help the Penguins win for the ninth time in 10 games. Patric Hornqvist had two assists. Murray improved to 6-0 with a 1.49 goals-against average in six games since coming back from a lower-body injury on Dec. 15. He also moved to 8-0 in his career against the Rangers, including the playoffs. Ryan Strome and Pavel Buchnevich scored for the Rangers, who were 2-0-2 in their previous four games and 2-0-5 in their past seven at home. Henrik Lundqvist, picked as an All-Star for the fifth time earlier in the day, gave up six goals on 18 shots before he was pulled less than five minutes into the third period. Alexandar Georgiev replaced him and finished with six saves. Malkin pushed Pittsburgh’s lead to 5-1 with his 13th goal at 1:03 of the third. He brought the puck up the middle, lost control of it as he skated through some Rangers defenders and then made a lunging poke to send it through Lundqvist’s legs before sliding into the goalie. Buchnevich pulled the Rangers back within three just 19 seconds later, putting the puck past Murray from the right side for his seventh. However, Pearson beat Lundqvist with a shot into the top right corner on a power play for his fifth at 4:40. That ended Lundqvist’s night. Crosby, selected an All-Star for the eighth time, made it 7-2 with 6:04 left. After a scoreless first period, the Penguins took control with four goals in the second — including three in a 5:51 stretch midway through. Aston-Reese, a native New Yorker facing the Rangers for the first time, got the Penguins on the scoreboard first. He took a pass from Matt Cullen from behind the end line, settled the puck off his skate and beat Lundqvist for his sixth at 6:29. Guentzel, who signed a five-year, $30 million contract extension last week, doubled the lead with a shot from the left circle that deflected up off Rangers defenceman Marc Staal’s stick into the left corner for his 17th with 8:39 left in the period. Letang made it 3-0 as he skated up the left side, cut to the net and fired the puck past Lundqvist for his ninth with 7:40 left. Strome got the Rangers on the scoreboard only 26 seconds later with a deflection of Brady Skjei’s shot past Murray. It was Strome’s fourth goal, and third in 20 games with New York since being acquired from Edmonton. Simon restored Pittsburgh’s three-goal lead as he beat Lundqvist on the blocker side for his fifth with 4:15 remaining in the middle period. NOTES: Crosby matched a career high with his fifth straight multipoint game. He has three goals and nine assists during that stretch, and four goals and 14 assists in his last 10 games. … Pittsburgh forward Phil Kessel was held without a point, ending a streak of three consecutive three-point games. He had three goals and six assists during that span. … The teams play three more times this season: on Feb. 17 at Pittsburgh, March 25 back in New York, and April 6 at Pittsburgh. … Staal appeared in his 800th regular-season game, becoming the 10th player in franchise history to play that many with the Rangers. Staal also joined brothers Eric (1,130) and Jordan (872) to become the first trio of siblings in NHL history to each play at least 800. Penguins: Host Winnipeg on Friday night to open a three-game homestand. Rangers: At Colorado on Friday night to begin a three-game road trip.